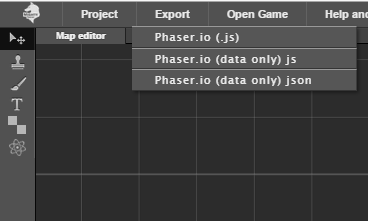 Phaser.io (data only) json – export only the game map data without any scripts as .json file. You can include this file in your index.html and continue developing locally. Note, that the 2nd and 3rd options may be blocked as pop-ups. You can also clone your project by clicking on Project->Clone.